long way in making this event happen and furthering the spirit of eWIT. Members can take our cause with your respective management and get them to support this movement. As usual we had an event filled quarter and your newsletter makes an attempt to bring to you all the many happenings. Women have to play multiple roles in her life. At any point you will find them play dual or more roles. A student and a daughter, a career woman and a homemaker, a boss and a mother…. Each of these roles carries enormous responsibility. Many a time one finds it quite exhausting. Dr. Soundarya Rajesh in the role model events gave us a splendid account of the various trials and tribulations women encounter while playing different roles. She explained the genesis of her enterprise ‘AVTAR Career Creators & FLEXI Career’ which focuses on getting women back on career track. Sexual harassment is a subject most talked about but least understood. What constitutes sexual harassment, the laws associated with it and women’s rights is something everyone should know and in particular those who dispense justice as part of committees constituted to deal with such cases. A special workshop was conducted by Mrs. Mahalakshmi Ravisankar, an independent consultant on legal compliance and a practicing company secretary from Mumbai. This workshop was an eye opener for all participants, both men and women. Our eWIT council members are taking the women empowerment message across our borders. 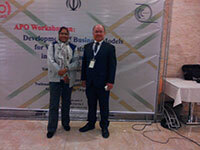 Ms. Jayalakshmi Thirugnanam –Joint Secretary – eWIT was in Tehran recently as a speaker in a workshop conducted by Asian Productivity Organization. She enlightened the participants about aspects of business models for women entrepreneurs. The eWIT Excellence Award is a much awaited event every year. The process of selecting the topics, inviting papers, scrutinizing and shortlisting them, evaluating the presentation of authors of shortlisted papers and finally announcing the result is an arduous journey. Like every other year, we successfully completed this year’s journey as well and selected our winners. Congratulations to all the winners! To me the most gratifying aspect of this quarter is the various International Women Day’s celebrations at our member organizations. Polaris FT, Cenza Technologies, Hexaware, BOA, eWIT Trivandrum … This goes to show that the movement is spreading and gathering momentum. eWIT had organized a very inspiring session on 30th January 2015 at Exemplarr Worldwide office Auditorium- as part of the ongoing Role Model series . This session introduced the participants to Dr. Soundarya Rajesh (Founder – President, AVTAR Career Creators & FLEXI Career ) - a self- made entrepreneur with a passion to support women in their career continuity and success in the corporate ladder. Ms. Lakshmi Manickam, Lead Technical Writer with Pershing India & eWIT GC member introduced Dr. Soundarya to the audience highlighting her contribution to the growing community of working women through her organization Avtar CC. Dr. Soundarya started her session by drawing a metaphor between the life of a woman on the career track and the drama of life represented by hero, villain and the ”challenge” which is the core storyline. She spoke about the career dreams of the young woman professional on the threshold of the great career journey. This modern career woman is well educated, full of enthusiasm and is willing to work hard to make her mark in the world. At a critical juncture when she has her career vision clear and also progressed on the road to success , the pressure from family starts mounting to get married and “settle down” . She is told that her biological clock is ticking and she must rethink her priorities. She then struggles to find the right balance between her profession and family. In many instances the struggle becomes such an uphill task that the harassed individual quits her job and chooses to focus on her family. She packs up her career dreams with no clarity if she can ever resume it. Dr. Soundarya emphasized on the multiple roles (or Avatar’s) which women play at home and office (daughter/wife/mother/daughter-in-law/employee/manager etc) and the tremendous effort required to stay motivated on the career path . She compared the relatively evolved western work setup Vs the Indian context where it is much more an uphill task to find the right balance between job and family. In her own professional life, Dr. Soundarya went through similar challenges and this inspired her to start an organization which focuses on getting women back on the career track (especially if they have taken breaks to raise a family). She highlighted the different ways in which her organization works with corporates to ensure that women have flexible career options. Her organization also works with aspirants to re-equip themselves to meet the changing skill demands in corporates. Dr. Soundarya also mentioned the “Tactician Training” which helps to build a network of mentors who can guide young professionals through the different challenges. During the Q&A session, some of the participants also shared their different experiences in their professional journeys. Ms. Rajalakshmi, COO from Cenza Technologies delivered the thank you note and handed over a memento for Dr. Soundarya before closing the session. 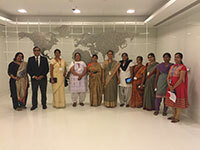 "The tooth and nail of sexual harassment law" was the topic on which a one day workshop was conducted in Chennai on January 31, 2015, for the benefit of eWIT members primarily designed to benefit those who are serving as the External Members in the Internal Complaints Committee (ICC) of various companies, as per the requirement of Sexual harassment law of women at workplace (Prevention, Prohibition & Redressal) Act, 2013. The session was a combination of understanding the technical aspects of the law, in non-legal terms, followed by an interactive session engaging with the participants on some of the practical issues associated with enforcing the law at the workplace. The session was organized by DVN-GL and conducted by Mrs. Mahalakshmi Ravisankar, who is an independent consultant on legal compliance and a practicing company secretary from Mumbai. In the course of the program, samples of complaint letters were shared with the participants, to help them understand how to differentiate a sexual harassment complaint from a routine grievance of a woman employee. In a role play session, the participants were called upon to enact real life scenarios around conducting the sexual harassment enquiry, with the victim and the accused, and the role that the Internal Complaints Committee (ICC) plays in adjudicating the matter. The participants got an opportunity to experience and demonstrate the sensitivity and responsibility of ICC members in conducting sexual harassment investigations by constituting a mock ICC wherein they deliberated on investigation reports. This was meant to impart them with the practical guidance on how to judge the gravity of a sexual harassment allegation and how to determine the extent and nature of punishment where the cases are proven. At the end of the session, the participants took back the message that "sexual harassment" is not a workplace menace alone - it is a social evil and it needs a collective intent to weed it out. The session had a mixed group of men and women, and as much as the women appreciated the program, as something that empowers them, the men were equally enlightened, on how the dynamics of the work place has changed post the enactment of the law. eWIT completes its 9th year. The paper contest that precedes our annual flagship event, the eWIT Anniversary Excellence Award, concluded recently with the oral presentation by the shortlisted participants. This presentation not only provided an opportunity for the women IT/ITES professionals to showcase their talent and expertise but also served as a forum for them to connect with each other and network. Papers were invited under three different categories namely Technology, Quality and HR. This was to provide an opportunity to a large number of women to participate. Internet of Things or IOT, the latest mantra in technology was the topic given for the Technology track. Participants created 'smart cities', dreamt of what a 'smart family' could be and came up with numerous interesting, future scenarios and their implementation with IOT. 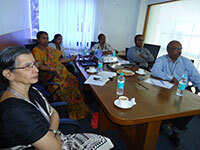 Quality track had 'Integrated Quality (compliance and risk management)' as the topic. Participants shared practical insights from their own experiences and their perspectives. HR topic was 'Workplace learning is changing'. HR practitioners presented their perspective of today's workplace learning and its implementation. The papers and the presentations were evaluated based on originality, presentation style, content, and practicability of implementation. RR Donnelly provided the venue and all the other facilities for conducting the oral presentation. The highlight was Alok judging remote from Noida, and several outstation participants presenting through video / audio conferencing. We parted with everyone acknowledging the great time and the fun they had participating in this great event. Each year International Women's Day (IWD) is celebrated on March 8. Find out how some of our member organizations Polaris, Cenza Technologies and Hexaware celebrated IWD. Krithika Swaminathan - Director, Enterprise Tools and Quality Engineering at Intuit - took her audience by storm when she addressed a gathering of women associates from Polaris Group and members of Ewit on 9th March. In contrast to the usual seminars, speeches and workshops conducted with regards to Women’s Day, Krithika’s session was one with a marked difference. Being a product quality expert, Krithika spoke about the challenges faced in product organizations and the transition towards continuous integration, automated tests and data-driven decisions. Being a woman, she spoke on what a woman could bring to the table in all of these areas. While talking technology, Krithika engaged with her audience on how women could add immense value to the organisation they work for and move into leadership roles through multi-tasking abilities and an eye for detail, among other strengths. A walk-through of FT 8012 was given to Krithika and the guests from eWIT. Women’s day @ Cenza was kicked off with a welcome drink followed by stalls for Mehendi. The day also had people breaking free participating in free style dance which brought out best moves from each of them & dazzling songs. A speech by the r Director Ms. Lakshmi Gopal was really inspiring where she talked about the challenges faced as a working parent. She brought out real and practical contexts and all the women employees were able to relate to the content which she was talking about. Women associates @ Cenza felt happy that we have they had the best counselor. They all then had a gala lunch together. 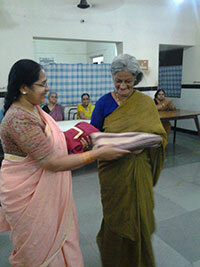 As responsible citizens of the nation, they also realized that they should contribute back to society and keeping this in mind, they visited Narbavi Senior Citizen Home for Women. They had a great time touching the emotions of each of the inmates by their interactions. They also conducted games and gave away gifts. The inmates were so sweet in hosting them by offering snacks. The Women@Hexaware (W@H as we love to call ourselves) is a group which is passionate about women’s empowerment and has voluntarily tasked itself with the mission of promoting and fostering the interests of women employees at Hexaware while exerting a leadership role in empowering them. We are indeed cognizant of the fact that as salaried women of the IT sector, we are shielded from the greater part of the atrocities that other women across the world suffer. But, at the same time we do face many challenges in moving ahead in life and career. Juggling family and career responsibilities remains an eternal challenge. The number of women in senior management roles is a very small number. Society still looks at a successful career woman as one who neglects family. And, in most cases, the best solution is to stand up and take action on one’s own, rather than depending on others. On 9th March we had the whole team of women employees, all dressed up in different shades of purple (aligned with IWD 2015 theme), gathering in the central court of our Siruseri campus, and the official photographer captured the happy moments for the young and vibrant women, as per their wish. Overall, IWD is a day that W@H looks forward to year on year!! 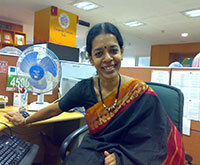 Sudha Gopalakrishnan was part of the IWD celebrations, Bank of America Chennai LEAD chapter. 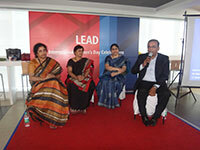 She was part of a panel discussion addressing aspiring women employees of the bank. She spoke about how to be a professional. It’s a dream come true for eWIT Trivandrum and young parents working at Technopark! A crèche in the Technopark to support young parents who work here has been a big need for a long time. The crèche is ready within Technopark premises with the support of some sponsoring companies to create a “Best in class facility” for 25 children. A curriculum was created with inputs from experts and women from Kudumbasree were trained as childcare workers for the crèche. Through this crèche project, we jointly find a synergy between eWIT that wants to provide a premium facility to a niche market and a Kudumbasree that has the aspiration and passion to provide a premium service to this market, thus providing safe employment opportunities for women and teaching them a new trade. In Kudumbasree, eWIT has found a partner who shares the passion, has the right intent and the ability to make this work. Why are we doing this and how? Work life balance is a regular mantra that we hear all the time in Technopark. The statistics clearly point to the fact that a lot of women leave work or move on to less challenging and less rewarding work when they become mothers. While a crèche will not tackle this problem fully, knowing that your child is safe and within arms’ reach in a first class facility will certainly help women stay in their jobs longer. This is of core interest for eWIT Trivandrum and for all employers who wish to not lose capable workforce at the prime of their career. Kudumbashree will be the service provider to operate this crèche. What is in it for all in the future? This marks the start of a model that can be replicated. What are the salient features of this best- in- class facility? The staff are all professionally trained carer givers. They have undergone intensive training in modules focusing on child care, health and safety, hygiene, first aid and emergency response, customer facing skills, Crèche admin basics etc. When will the crèche be ready?